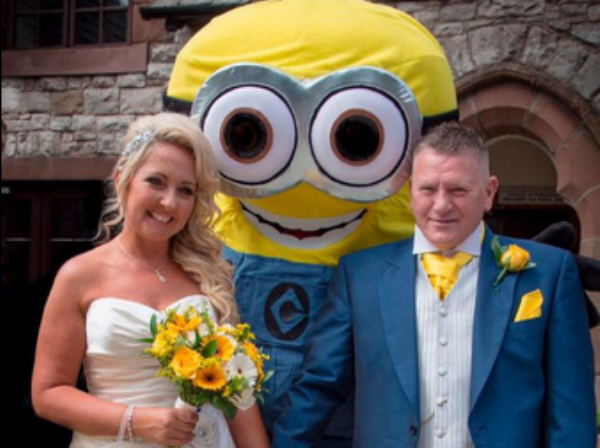 You could say their wedding was one-in-a-minion. Sam Finan and Bob Thomas, super-fans of the movie Despicable Me decided there would be no better way to spend their Big Day than using the movie’s cute yellow creatures as a wedding theme. In fact, the big day was a minions galore: there was a minions cake, place settings, and decorations. On top of it all, the bridesmaids wore yellow dresses and the groomsmen donned yellow ties with minion cuff links. “The guests absolutely went with it. Everybody was wearing yellow ties and yellow flowers. It got everybody together and everybody got into the spirit of it,” said Sam. Bob even has a tattoo with a minion bride and groom on his leg.